VALLEYFIELD, Quebec (CNS) — Even though medical assistance in dying has been legal in Quebec for almost a year and in Canada for a few months, Bishop Noel Simard of Valleyfield has not yet come to terms with this new reality. To him, medically assisted death is just plain euthanasia. Bishop Simard acted as a spokesman for Quebec and Canada’s Catholic bishops on issues related to life. The bishops have not been able to persuade the legislators to refrain from legalizing euthanasia and assisted suicide. Despite his numerous interventions on the issue, Bishop Simard had to watch this new paradigm reshape the Canadian medical world. “This ‘medical-assistance in dying’ is a threat to the foundations of our society,” he said, arguing that it challenges some basic values: the way laws used to prohibit homicide and the way medical personnel are expected to treat their patients. In the past few years, Bishop Simard has been one of the most vocal Canadian bishops on this issue. He sometimes used harsh words to express his opposition to euthanasia. In the early 1990s, in his early years as a priest, he accompanied a score of terminally ill AIDS patients in Sudbury, Ontario. When he recalled those years, his voice became soft and muffled by emotion. “I’ve seen people die, many. We all assume that terminally ill patients desperately wish to die. But it isn’t the case: What they long for, first and foremost, is someone to hold their hand and accompany them,” said Bishop Simard. He said this whole process helps them give meaning to their suffering and reclaim for themselves some dignity. “Too often, we tend to limit one’s dignity to his ability to interact, to speak, and to remain conscious. But dignity shouldn’t be related to a capacity: Dignity is intrinsically and inherently attached to us, as a human being. And that intrinsic dignity remains attached us, no matter what happens,” the bishop said. “Each individual is becoming his own standard. He’s offered values of self-fulfillment through pleasure. No wonder suffering is being thrown away. It’s an obstacle to pleasure and enjoyment. In a hedonistic and epicurean society such as ours, suffering is a nonsense that needs to be eliminated. When I’ll no longer be able to enjoy myself, help me get out of here,” said Bishop Simard. In today’s society, one’s ultimate value is too often determined by what he or she can produce, said Bishop Simard. 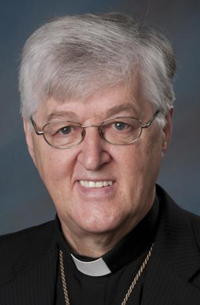 The bishop said he was troubled when he saw a study recently published by the Canadian Medical Association suggesting that medical assistance in dying could eventually allow the country’s health care system to save $139 million yearly. Such projections are Bishop Simard’s worst fears. In the past few months, the Canadian Catholic Church has had debates about the pastoral attitude to use with people who choose a medically induced death. Bishops from Alberta and the Northwest Territories opted to refuse funeral rites or sacraments to people that deliberately want to be euthanized. The Atlantic bishops said funeral rites could be offered. In Quebec, the Assembly of Catholic Bishops simply published a document to offer some spiritual guidance to terminally ill people. Bishop Simard said he was not surprised to see so many church debates around the pastoral responses to medical assistance in dying. As the official statistics reveal that more and more Canadians opt for euthanasia, the church must continue its reflection on “how to communicate Christ’s message, as well as the teaching of the church, so to offer some compassion and a soothing and healing voice to broken hearts,” he said. Vaillancourt is editor of the Montreal-based Presence info.